“We will be closing Gorge Road between Playford Bridge, Castambul and Torrens Hill Rd, Millbrook / Paracombe from 12pm today until 12pm Monday 30 June 2014. 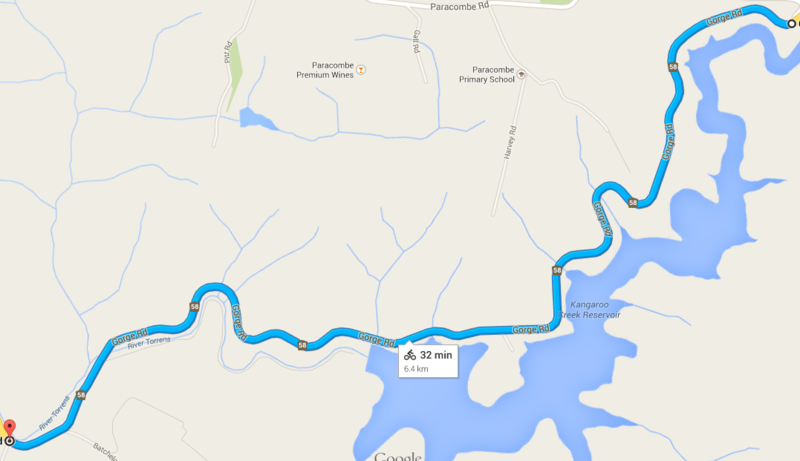 Image compliments of Google Maps! Don’t forget to register for the race by 10am Saturday morning. If you have any dramas with registration, email timing@ambc.asn.au. This round brings us to Dazzleland at Mt. Torrens. These trails are only ride-able at sanctioned events so get on it and have a shot. If you’re aim is to contend in the Elite Series this year and you’ve only made it to one of the Enduro races so far, you’ll need to make sure you complete one lap at this round to qualify. The club is always happy to accept volunteers, so if you can help on the day then contact racevolunteers@ambc.asn.au to let us know. Every volunteer gets a transferable race entry and a “Timekeepers BBQ super-happy-fun-time meal deal” (sausage with bread, onions and sauces, tin of soft drink and there’s talk of some soup for this round – if you ask nicely, we’ll even warm it up for you!). 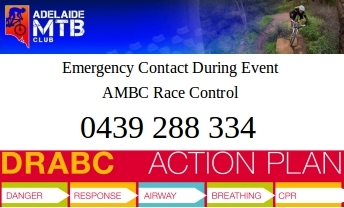 The club has introduced an emergency contact phone that will be used at races to contact a race official at the start/finish area in case of an accident. We have also printed up some stickers for the backs of race plates. They will be available for people to grab at registration. This number is to only be used for emergencies and will only be monitored while events are being run, so don’t call it for general information. This entry was posted in AMBC Races and tagged Hammer Nutrition, In Case of Emergency, Mt. Torrens, XC Enduro Series by P'An-Tau. Bookmark the permalink.